With the right food storage knowledge and equipment, you can keep food items fresher longer. Teach your food service workers to delight your guests with fresh, appealing buffet and salad bar displays. By keeping foods clean, fresh, and contamination-free, you can earn your customers’ trust and loyalty! Coldmaster Crocks store expensive items like condiments and sweets for 8 hours without ice baths (and 12 hours, with lids). 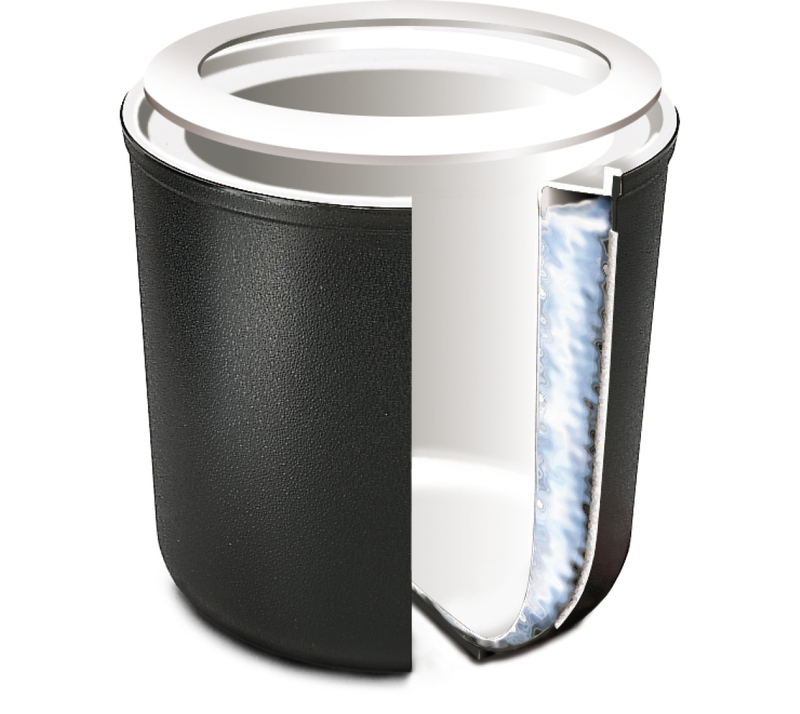 These insulated gel-cooled crocks fit standard nozzles and pumps and keep runny toppings safely cooled and contained. When insects and vermin contaminate poorly stored foods, they can take a big bite out of your quarterly profits. Not only do cardboard boxes provide little protection against critters, they also transmit moisture to foods. 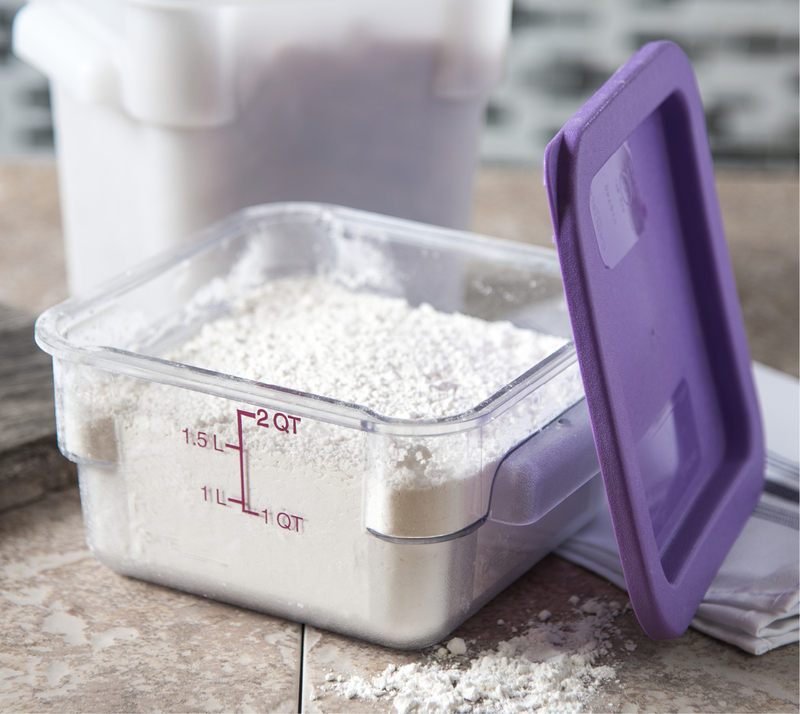 Extend your ingredients’ freshness and servable life with StorPlus Food Storage Boxes & Lids. These convenient, color-coded food boxes quickly pay for themselves by helping you save big on food waste. Foods on display that sit in water and other liquids can quickly lose their freshness. Thawing foods that soak in water lose their quality (and eventually, their safety). StorPlus™ Polycarbonate Storage Container Colanders allow foods to drain and maintain optimal freshness. StorPlus™ Food Pan Drain Grates keep foods on tray tables and food bars from sitting in water or oil and excel in chilled/frozen food storage environments. These convenient devices keep kitchens clean, organized and uncontaminated; they allow cold and iced salad bar items to drain and stay fresh. For example, you can use them to display iced drinks and keep shrimp from sitting in water. Train your employees to select partially used foods before opening up sealed packages. Make sure older items don’t go unused when new shipments arrive. Use transparent containers to view “use by” dates and estimate food quantities quickly. With a little care, you can get more of your food items onto the table and fewer into the dumpster. StorPlus square and round food storage containers and lids feature 4-sided date indicators to help you track food quality. Color-coded to match their capacity indicators, these containers make inventories a snap. Offer fragile foods in small dishes to avoid crushing by the items above them. Serving your most expensive salad bar items at the end of your buffet line will encourage customers to take reasonable portions. Serve these pricey items in small trays to reduce waste. You don’t want to throw out a large tray of expensive food if someone sneezes on it (or you simply have a lot of leftovers). 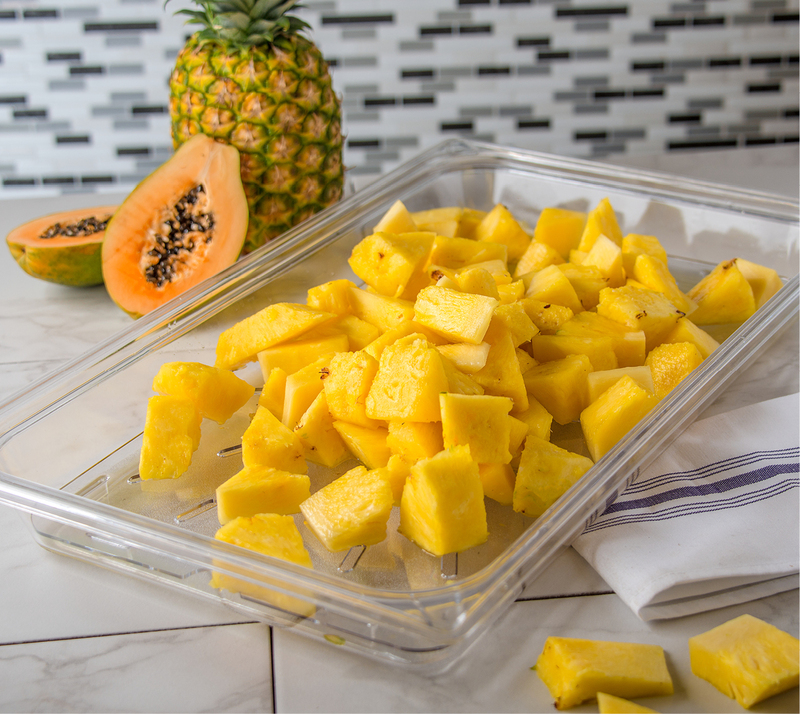 Always offer the freshest foods on your salad bars/buffets and keep ingredients safely stored before preparing your dishes. Nothing makes a bigger difference to your bottom line than customer trust. Avoid costly food-poisoning scares and scandals with top-notch staff training and industry-leading food-storage/presentation equipment. Your customers don’t just deserve safe foods; they demand the freshest and tastiest ingredients available. Sure, you can let food sit on your salad bar/buffet for the recommended amount of time. But, what if you delighted your customers by presenting smaller quantities of piping hot and freshly-chilled delights at more frequent intervals? Present fragile items in small, one-layered containers to avoid crushing. Let meats sit above oils and drippings in trays. Offer smaller numbers of condiments, toppings, and treats in greater variety. 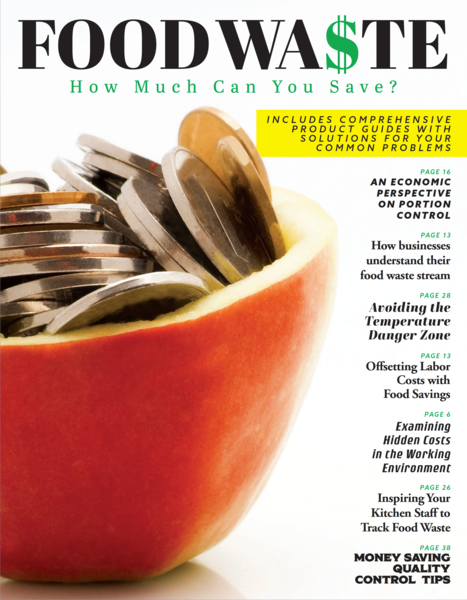 Sure, your employees may have to refill your salad bars and buffet tables more often, but that only leads to greater food safety and quality! Train your employees to wash foods only right before use to maintain freshness. Remind them to only scrub waxed fruits and root vegetables. You have the colanders you need to wash fragile fruits and berries gently – and only right before use. By limiting the amount of time vegetables are exposed to air and water, you maximize their quality, safety, and taste! Of course, your food-handlers know to keep cardboard boxes of food off your freezer/cooler floors. They store vegetables above meat items to prevent dripping from creating cross-contamination. However, why use cardboard boxes at all? By transferring foods into stackable, sanitary plastic containers as soon as they arrive at your restaurant, you can save money on food waste, offer fresher items to your customers and increase your profits far more than the cost of these food containers. Remember, keep your staff trained in food safety basics, especially TCS food safety and temperature control regulations. Make a habit of quizzing people in the kitchen and at your buffets/salad bars about proper food holding temperatures (above 140°F and under 40°F). Know the procedures, codes, and standards inspectors expect and sail through every inspection with flying colors! We make food storage, display and inventory a snap. Save big and stop wasting food by keeping foods in convenient, transparent, and safe containers—not soggy and poorly stacked cardboard boxes. Invest in food containers today; they’ll pay off in reduced waste and increased food quality!